Sometimes you’ve just got to wonder who on Earth would approve designs like these. We didn’t think that it would be so hard to design something for Christmas, surely you just throw sparkles, glitter and colour at it, right? Whoever designed these leggings either made them intentionally terrible or just really didn’t think it through. Santa seems to be having a great time on the back of these leggings and the front…we have no words. Whoever put THAT hand THERE really didn’t think about what they were doing. 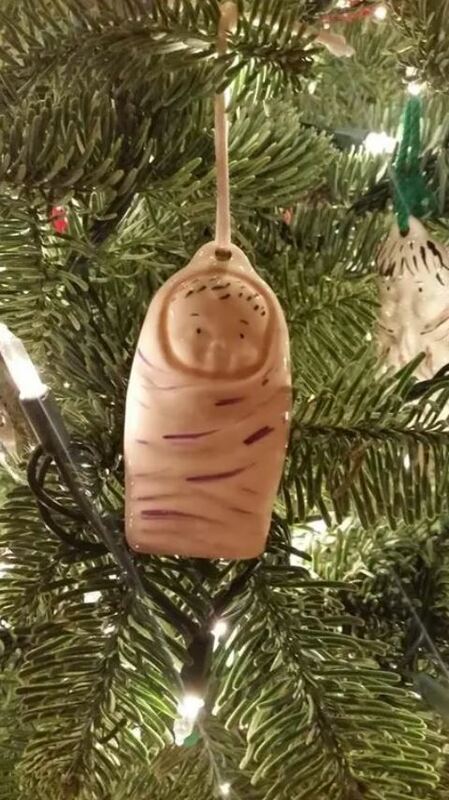 This Christmas decoration reduces the holy baby Jesus into a big toe. Honestly, this design is so bad that if we glanced at it passing by, we honestly would have thought that someone was decorating their Christmas tree with big toes. Whoever designed this Christmas sign really didn’t think about ordering the letters correctly so that, you know, it actually said Christmas. 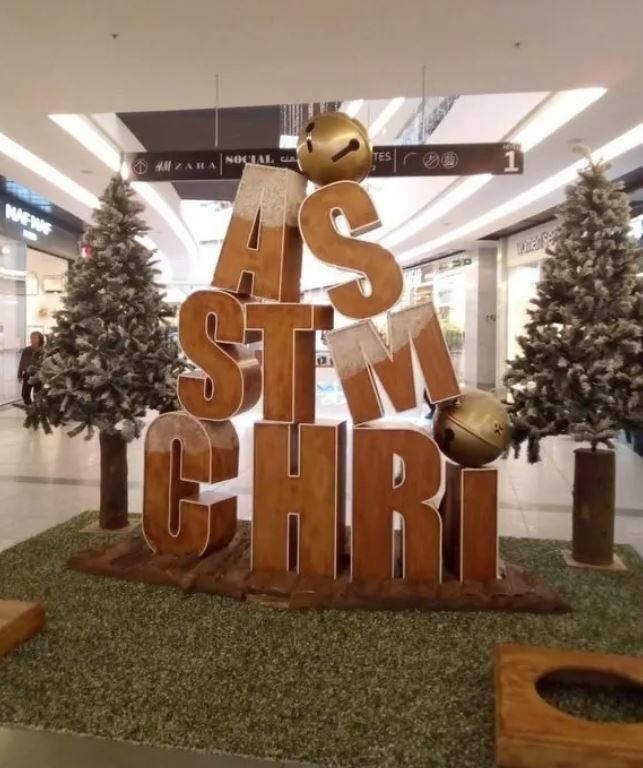 So, it now says “Asstmchri” which I guess is just as catchy, right? This is probably the worst faux pas Christmas tree we have EVER seen. 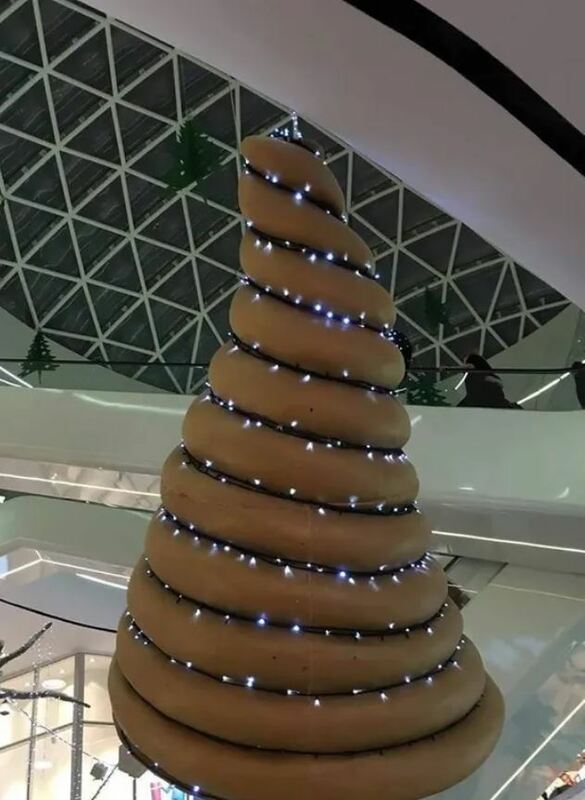 Whoever designed this huge shopping mall Christmas tree didn’t think that it actually looks like a MASSIVE turd. They’ve essentially just made a festive turd by putting lights on it. Amazing. This Christmas mug may be attempting to be festive with the red colour but all it’s ended up doing is making it look blood-splattered. 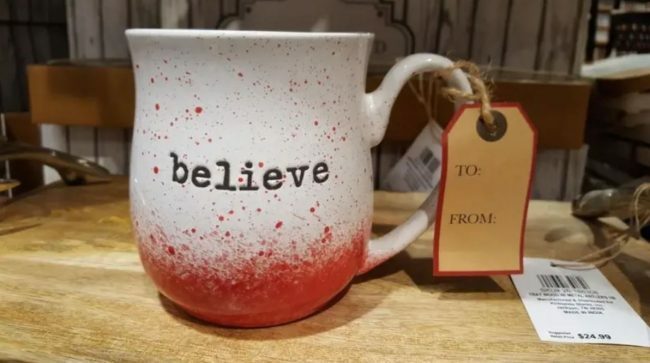 Was this mug found at the scene of a crime? Who knows. The whole candy cane nose and eyes thing may have seemed like a great Christmas idea. 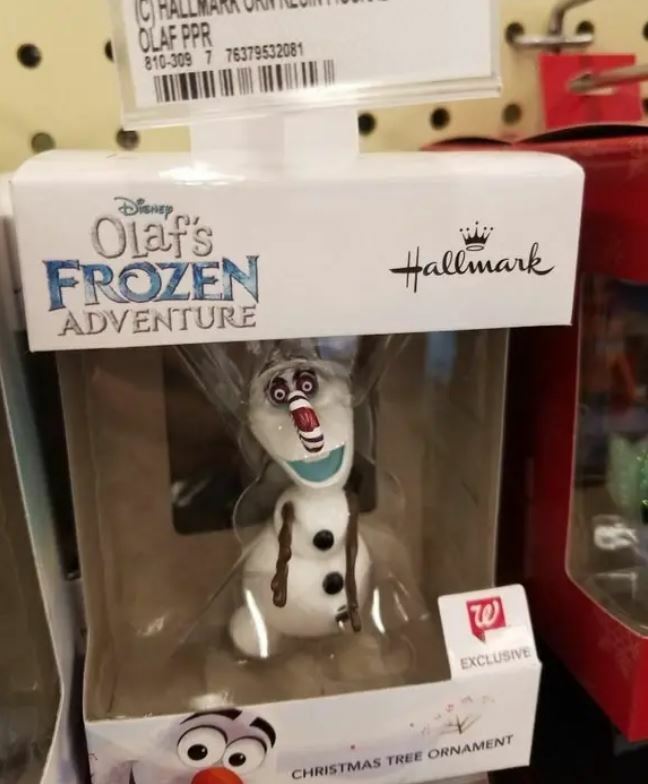 However, Olaf has ended up looking absolutely horrifying with crazed, murderous eyes that will definitely watch you while you sleep. ‘TIS THE SEASON TO BE JOLLY! 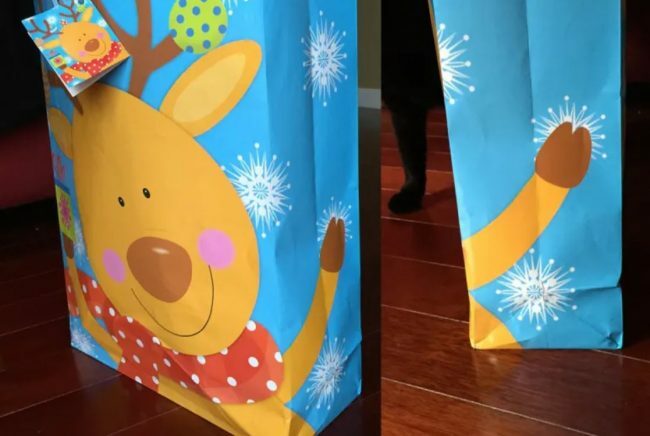 This reindeer leg and hoof that appears on the side of this Christmas gift bag definitely looks like something else entirely. We can’t help but giggle at its resemblance to something VERY different. Bad design alert! 8.) Is this son called Dad? 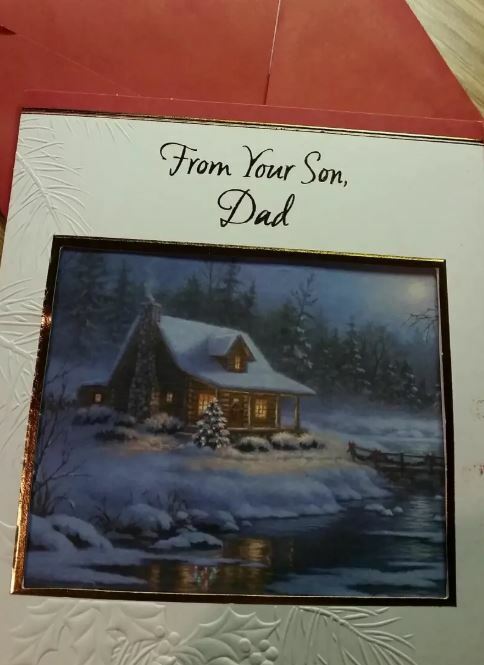 This badly worded Christmas card sounds like it’s from someone who is called Dad to their Dad. It’s all very confusing and we wouldn’t want to be on the receiving end of this Christmas tragedy. 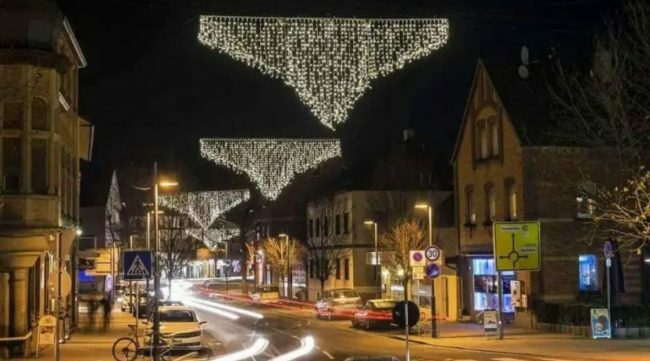 These Christmas lights look like huge floating underpants and it’s AMAZING. How could someone not have noticed this as soon as they put them up?! We love how many of them there are, going all the way down the street. It’s like underpants are descending to take over the human race. 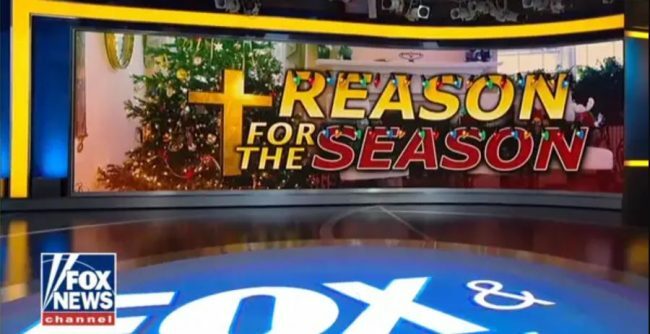 Fox News didn’t think it through when they positioned the cross THERE. We don’t know anyone who didn’t read this as “treason” and it’s hilarious. Betray your country this holiday season, how festive! 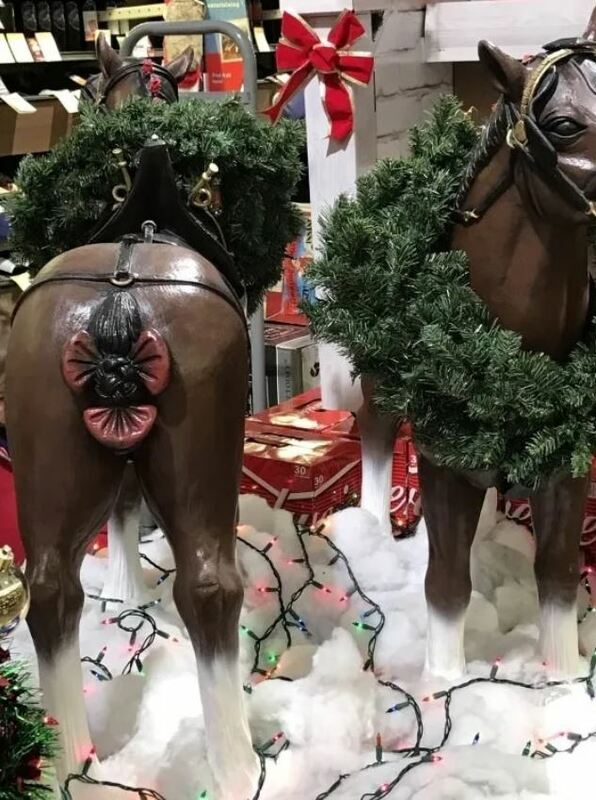 The bow on this horses’ rear just really doesn’t look too good. This who Christmas set up is wonderful and then there’s THAT, right in your face. Ew. There are so many things wrong with this sign, we don’t know where to start. Firstly, that reindeer looks like he has that poor boy in a headlock and the boy’s eyes are begging to be released. 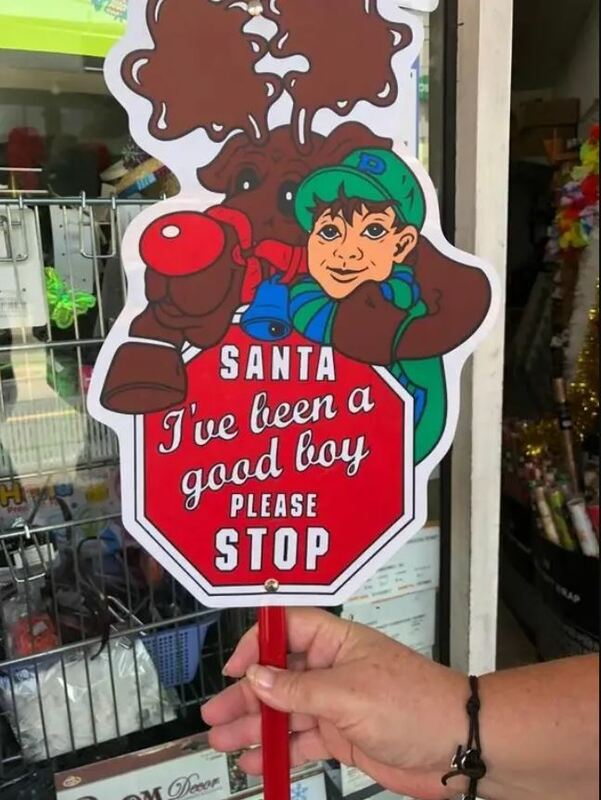 Secondly, the way the sign is worded makes it sound like the boy is begging for his life and that Santa is some kind of malicious torturer. 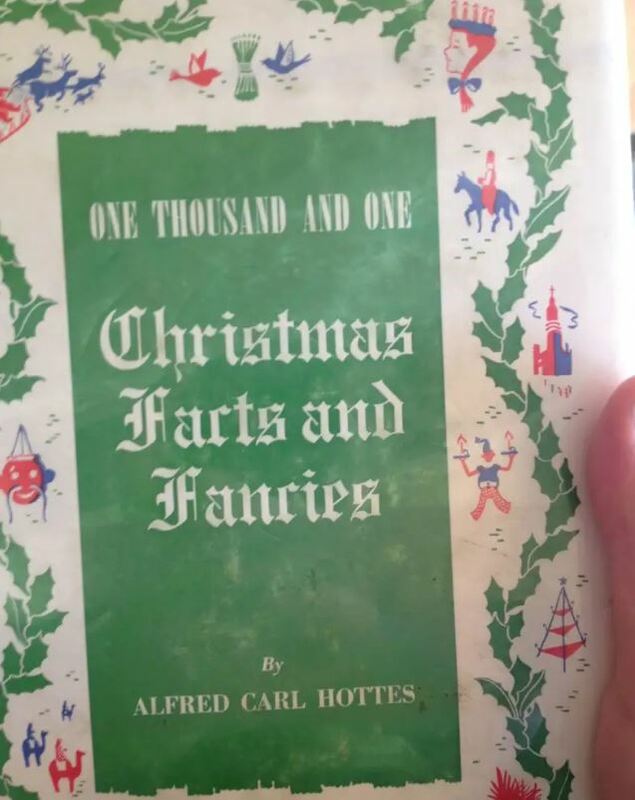 ‘TIS THE SEASON TO BE JOLLY! 14.) Who’s feeling thankful this Christmas? Now, this one is inexcusable. 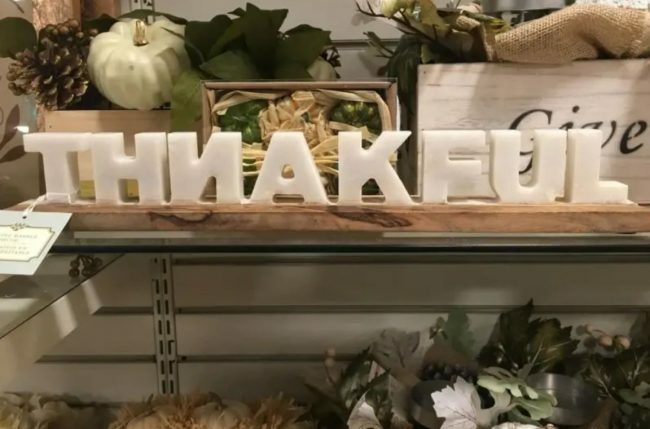 It’s not a bad design but to spell thankful wrong is pretty bad guys. Who works in your quality control department?! 15.) Santa pees maple syrup? Who knew?! 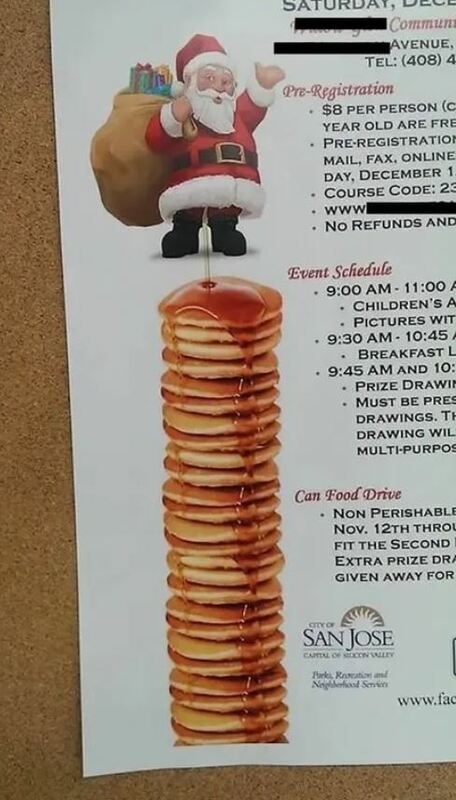 This poster makes it looks as though Santa has a magical power that allows him to pee syrup all over your pancakes, yummy! We honestly don’t understand how this design fail even happened…maybe it was intentional? 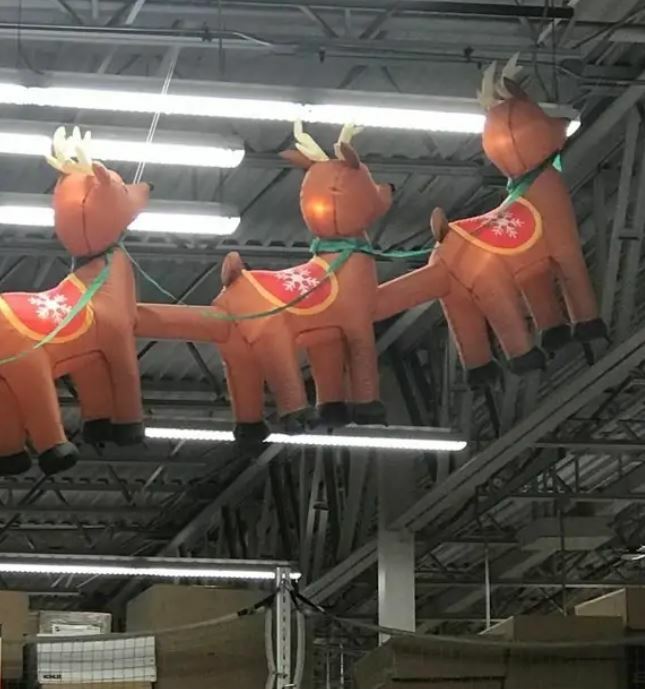 These poor reindeers look like they have been kidnapped by the creator of the human centipede and have been grotesquely joined together in his latest sick experiment. We can’t think of anything more festive than that. Seriously?! How can someone that designs lights like these NOT think that they might just bear a TINY resemblance to something just slightly inappropriate?! 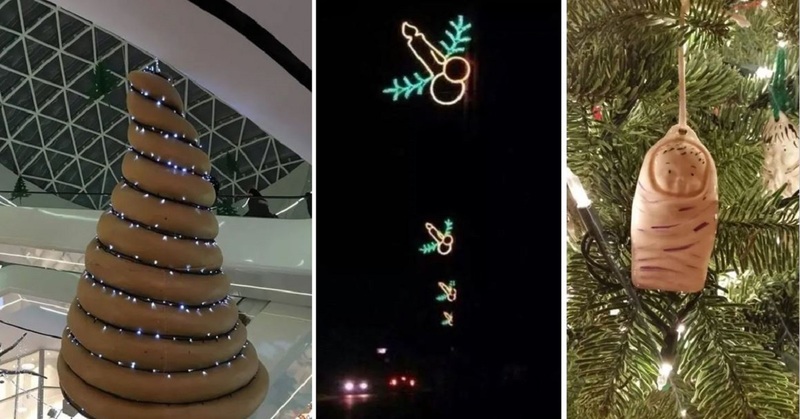 These Christmas lights just look like a whole load of phallic objects. 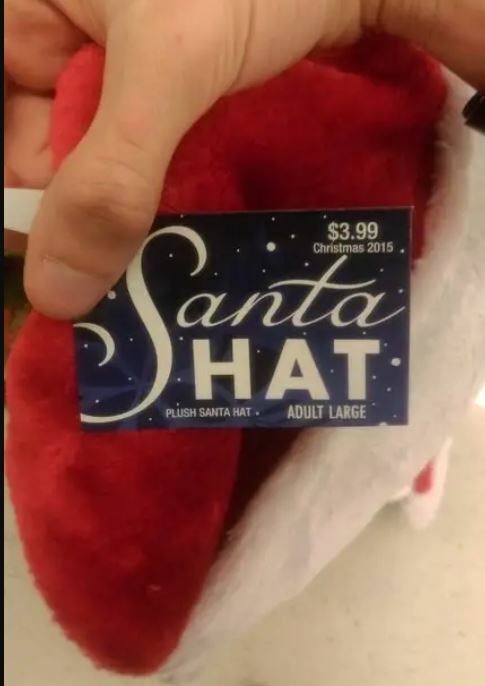 The label of this hat really looks like it says “Santa shat” and we are sorry to hear that but it’s a little too much information.